Concerts and Broadway Entertainment: At home, you usually have to pay big bucks to see a Broadway show or live concert. But onboard, these shows are included in your cruise fare so you don’t have to pay anything out of your pocket. However, for many cruise lines, you are required to pre-reserve a seat online. Many of the shows fill up fast and you may miss out on watching some incredible entertainment if you don’t pre-reserve a spot. Cruise ships provide an itinerary after boarding to show you what is available during your sailing. Pool Access: Take a relaxing dip to start off your day or have an all out pool party every afternoon! Most ships will have pools to accommodate all ages, from kid’s water parks to an adults-only hideaway, and even areas for the whole family. Movies: Catch a movie in the theater or under the stars at the pool’s big screen. You can watch a movie while swimming or sunbathing and not even need to leave the main deck. Now that is multitasking vacation style. Complimentary Snacks: After a day playing at the pool or attempting the ropes course, you will need to feed that appetite you’ve built up. You earned it, so get some pizza and don’t forget the ice cream. Explore your cruise ship and find out what is offered onboard. Specialized Onboard Activities (minimal fees may apply): Play bingo; join in a karaoke competition, then dance the night away! There are often parties geared for both family and adult gatherings. 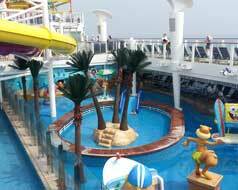 Specific activities are dependent on the cruise ship as well as the cruise line. These may include bumper cars, mini-golf, flow riders, waters slides, ice skating, ropes course, and so much more. Some ships even offer a sky diving experience. Whatever your cruise ship offers, take advantage of the opportunity! It will be unique to your cruise and your vacation. Kids Club: Often you can find complimentary kid’s clubs geared toward individual age groups. They have kid-friendly activities and certified instructors to interact and entertain. This gives an escape for everyone in the family. All onboard activities are conveniently close. This means that you don’t need spend half the day driving to different locations to participate in multiple events. Instead, just head up or down a floor or two to obtain access. For a list of cruise activities offered onboard, please refer to the cruise line’s website or speak to a travel agent. While cruising, take a look at the daily cruise schedule provided by the cruise line. This is your vacation so make it memorable and take advantage of everything free!